While I was driving on Friday night, I looked for my next blog entry to occur, and at the same time I searched my memory for stories that already took place. With hundreds of pages of journal entries from the past 6 years, I have enough memory triggers to finish my 100 chapters to complete my taxi book. However, I suddenly had a brainstorm, as I was jotting down information about an interesting passenger. What if I wrote notes about every fare for an entire night, from the first, to the last, to show how a night develops, and chronicle, the way that each night develops its own theme, which is directly influenced by a multiplicity of factors, including the time of year, local events and most importantly the zeitgeist. So the following are the slightly edited entries that I made, as I waited at red lights, in parking lots, while waiting for fares or even driving on the straightaway, occasionally. The entry may be longer than normal, since I had a total of 26 fares for the night. I hit the street a few minutes before 4:00 PM, driving number 77, the Buick lesabre sedan, with leather upholstery. It was raining and about 45 degrees, when I called in and got sent to a hair salon in Keizer, where I picked up a 90 year old woman who got her hair done. I drove her home for $5.00, plus a$1.00 tip, as she talked about how hard it was to depend on taxi’s and other people, after driving her whole life. My next call was at the Fred Meyers in Keizer, where I picked up a guy in a wheelchair with a medical dog. After struggling he got in the front passenger seat and his large white dog got in back. On the way to his apartment, off Cherry Ave., he told me that he was paralyzed in 1977 when a friend that he was riding with rolled his car, and my passenger’s neck was broken. Now he needs shoulder replacement surgery, because of overusing his arms to move around. His fare was $5.00 with a $2.00 tip and a neighbor teenager took out the wheelchair and carried in his groceries while I ran his debit card. I picked up an elderly woman, who was in her 70’s, in North Keizer and drove her to the Red Lion, on Market for a 60 year anniversary party for some friends of hers. We talked about the current divorce rate and the one parent families that create progeny that never saw a complete working family with both father and mother. She handed me a $20.00 dollar bill and said to keep the change for the $15.20 fare. At 5:14 PM, I picked up a woman and three children, aged 10 – 16, who had 2 shopping carts, one with food and one with bricks. After loading everything in the trunk, we drove to her house, and on the way I told her the story of how we overloaded a trailer over 3 times when we moved from Bakersfield, California to Detroit, Michigan in 1984, when the trailer axle broke in Anderson, Indiana. Her fare came to $11.00, and she gave me a $2.00 tip, while her kids and I unloaded the trunk. At 6:00 PM, I picked up the librarian, who regularly takes a taxi to her home in West Salem, and she told me a joke, as she usually does. “Why did the chicken cross the playground?” She asked, and answered after I shrugged my shoulders, “To get to the other slide.” Then I headed into the deep West to pick up a guy and his two kids, to take them to a home in the South West, off River Road. On the way there we talked about movies and his son asked me if I ever saw Star Wars. The guy worked in flooring, in Portland, and said that Blockbuster video stores all over Oregon were closing, and that a year from now we would be looking back to this time as the good times. He handed me a twenty for his $17.00 fare and said to keep the change. At 7:00 PM, I picked up 4 guys, in the downtown area, who were going to the “Alice In Chains” concert, at the Armory, by the fairgrounds. On the drive there we talked about how the band recovered from Layne Staley’s drug overdose death, and they were interested in how the stage show would compare, now. It was still raining and they gave me $15.00 for the $11.10 fare. I was dispatched to the Super 8 Motel, but nobody was there, so Erin the dispatcher sent me to the Shilo Inn, where I picked up 3 guys who were going to the Alice In Chains concert. I told them that the traffic was backed up and it would take us 30-40 minutes to get there, if I took the regular way. However, if I took a roundabout way, that would cost $3.00 more, I could get them to the front door. They agreed and gave me a $10.00 when we got there. Next I picked up a group of guys from the Red Lion, and took them to the concert with the same results. Finally I picked up 3 young women, at Newport Bay, who were going to the concert. I told them the same story about the traffic and they said go the best way. One of them said that she thought it would be fun drive around listening to the radio, while you were making money. I told her it was, but that sometimes you had to drive people that you couldn’t wait to get rid of. When I dropped them off at the front door they gave me a $10.00 tip as well. I got the call to pick up one of our regulars, Carl, who went from Gepetto’s to Michaelangelo’s, to have a few drinks, and play video poker, 7 days a week. Carl is Viet Nam vet, who sometimes tells interesting stories. Today, because of the brouhaha over the “Alice In Chains” concert at the Armory, Carl began to talk about the Rolling Stones. He said that he thought that Mick Jagger was one of the ugliest human being alive, and that Keith Richards didn’t have a memory. I told him about the time that Larry Norman told me about Mick Jagger’s million dollar book deal, that he returned the money after he couldn’t remember enough to write an autobiography. The next call was for a regular who was going to Players Lounge on his night off. Then I shot North to pick up a Black lady at an apartment complex, who wanted to go to the North Walmart. After that I went East, and Erin sent me to the HUT shuttle. On the way there I stopped at Taco Bell and got 2 burrito’s, that I ate before the bus came in. I got number 49 mad at me, since he was there first, because I parked in front of him, even though I was the first cab called. I may have to apologize, but I won’t see him again after tonight, until next Friday. The elderly lady that I picked up went to North Keizer, and we drove past the newly erected statue of the founder of the city of Keizer. When we arrived at her house, the meter read$17.10, and she gave me a $20.00 bill. On the way back downtown, I picked up 3 guys who flagged me down on North River Road, close to Quinaby Road. They were going to the Silver Spur, and on the way there they talked about the hot chicks that they were going to score. The last guy out handed me a $20.00, and told me to keep the change or the $14.80 fare. My next call was on the East side, where I picked up a woman, who looked like one of the most problematic regular drunks that takes a taxi. However, it wasn’t her. She was tight on cash with a $100.00 bill that she cashed at a 7/11, and had me drive her to a trailer park by home Depot. She gave me a $10.75 to pay for her $10.30 fare, and asked for my number, so she could call for me later. Sometime after 11:00 PM, I got a call for the Armory, where the Alice In Chains concert was over. When I arrived, I picked up the guys who had come from the Red Lion earlier. They wanted to go to McDonald’s, but the dining room was closed and the drive through line had 8 cars in it, so they got out and gave me $15.00, to pay for the $7.30 fare. Then I picked up a Mexican girl, who was at a 16th birthday party, that was a $3,000.00 blowout, at Reed Opera House. She went to North Salem and her mom paid the $11.50 fare, with no tip. After I called down, I was dispatched to Denny’s on Market, where I picked up a group of people who had attended the Alice In Chains concert. 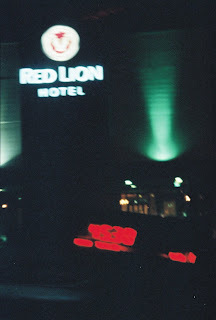 They said that it was good, and they enjoyed the opening band, whose name they couldn’t remember, and I dropped them off at the Red Lion, where they gave me a $5.00 bill, for the $3.90 fare, and they told me to keep the change. Next I picked up a Mexican guy at Von’s Tavern, who told me about the cultural barrier that he encountered, when he was living with an Arab woman. After I dropped him off, I was following a couple of Gypsy Joker, outlaw motorcycle bikers down 17th Street, in the rain, to Mission, at around 1:30 AM. The woman in the trailer park behind Home Depot called for me, so I picked her up, and drove her to South Salem. She told me that she was a convicted felon, who served time in prison, and was trying to live a straight life. She was married for 5 years and had a 2 and 5 year old child, who she took to the Methodist church every Sunday. She hated to go home, but where else could she go? She asked. 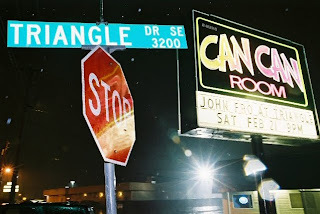 A little after 2:00 AM, I picked up a couple of guys, in front of the Can Can, who were heading to the East side, the caller’s name was Lee. They wanted to play Cash Cab, with questions about Salem, so I obliged. “Why is Salem called the Cherry City?” I asked, and explained after their dead air, that at the turn of the 20th century, that was its main export. Then I asked them about escaped convict, Diane Downs, and convicted prison official murderer, Frank Gable. I concluded with questions about John Fahey and Larry Norman, so when we arrived at their destination, I didn’t kick them out of the cab, but collected the $14.70 fare and a $5.30 tip. Stars Cabaret was the next stop, as I picked up 2 guys who were going to the Travelodge on State, and had attended the Alice In Chains concert. They were from Vancouver Washington, and wanted to go to the drive through at McDonalds, which was slow. We talked about music groups, and by the time that we finally got to the motel, the meter read $19.70, and they gave me a twenty, with a .30 tip. It was nearly 3:00 AM, when I was sitting on Amtrack, with number’s 2 and 55, exchanging stories, when I got a call. “Number 25,” Dotty, the graveyard dispatcher announced, over the radio. “Go to the Polk county jail in Dallas, on Jefferson Street, and pick up Jeremy. We already have a credit card run for the $40.00 trip.” I had to get gas first, since I was on an eighth of a tank, and didn’t want to get stranded. Afterwhich, I headed out Highway 22, to the Dallas turnoff, and picked up my passenger, who was standing outside, when I arrived. He got arrested and taken to jail, where he blew an .03, which was not even close to drunk, and was released. I picked him up and drove him to his place in West Salem, where his girlfriend was waiting. The meter read $43.50, but I accepted the $40.00, as enough. By the time I was clear, and back down town, I was ready to go home, since it was 3:47 AM, but Dotty gave me another call. It was for an address in one of the worst areas of Keizer, where drug dealers and prostitutes live, in the middle of muddy squalor. When I arrived I couldn’t find the address, and concluded that it must be in the back of another house. Before I could move my cab, a man came out of the weeds, growing around the railroad tracks, and opened the back door behind me. After he got in, I asked him to move up front with me, which he promptly did, saying that he understood why I asked him to do that. What could I say? Sometimes things happened like that, so I asked him where he was going and he gave me his address, which wasn’t far away. As I began to drive I saw a man standing in front of the house that I was next to. “Did you call for a taxi?” I asked. “The guy inside did.” He told me. I told him, that I would be back in five minutes, and drove the guy in my cab to his destination. I guess it was just a coincidence that this guy popped up. On the way there he was talking on his cell phone. He told, the person, who he said was his wife, on the other end, that God sent me to save him, because he needed a ride, since he was in violation of his parole, because he was past his curfew. When I got him home the meter read $7.00, which he gave me with no tip. I immediately returned to the address that my passenger was waiting at. When I arrived, there was nobody in the yard, but then the guy who I talked to before appeared. He had shoulder length hair and a handlebar mustache, with the hard look of an ex con and told me that the guy would be out in a couple of minutes. Shortly thereafter, a beautiful woman, who appeared to be around thirty got in my cab, and said that she was going to some apartments off Fisher Road. When I pick up a beautiful woman at a sleazy address at 4:00 AM, and drive her to an apartment complex where a friend lives, I usually assume that she’s a prostitute. However, in this case, the guy who lived at the address called her, a him, twice, so maybe it’s a she/male. I’ve driven cross dressing transvestites on occasion, and even had one proposition me on a dark rural road. Prostitutes, like strippers, generally did not tip well. When we arrived, the meter read $11.90 and she gave me $12.00. Dotty asked me if I wanted to go home or do another call. I told her that I wanted to go home, and said goodnight.